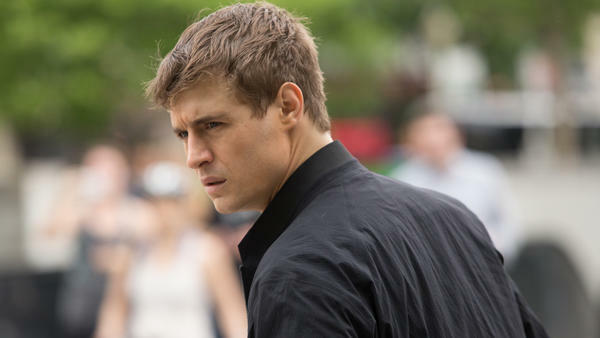 CIA analyst Joe Turner (played by Max Irons) struggles to figure out who to trust and who wants him dead in Condor, a new series on AT&T's Audience Network. Near the end of Philip Roth's novel Operation Shylock, a Mossad agent makes light of the modern penchant for conspiracy theories. "It's a paranoid universe," the spy says, "but don't overdo it." Hollywood never overdid it more than in the 1970s. In the years after Richard Nixon's tarnished presidency, movie screens were flooded with conspiracy thrillers — from Chinatown and The Parallax View to All the President's Men. One of the most enduringly popular was Three Days of the Condor, a 1975 hit starring Robert Redford as a CIA analyst who becomes the target of his own agency. To escape an assassin (played by Max von Sydow), Redford's character winds up forcibly enlisting a complete stranger (played by Faye Dunaway). This hall-of-mirrors story has been updated in Condor, a gripping new series on AT&T's Audience Network. Transposed to D.C. from New York, the show stars British actor Max Irons as Joe Turner, an analyst who writes terrorist-hunting algorithms for the CIA under the eyes of his uncle Bob (played by William Hurt), an agency bigwig whose in-house nemesis is played by Mira Sorvino. Joe stumbles across information so volatile it gets all his office mates killed and forces him to run for his life. As before, he shanghais a woman — here, a lawyer played by Katherine Cunningham — but, less creepily, she's at least someone he's been on a date with. He must try to survive long enough to figure out who to trust, who wants him dead — and why. Now, Condor differs from the original movie in several ways, most obviously that Irons and Cunningham can't match the charisma of the alluringly aloof Redford and the spiky Dunaway. It's not their fault. Both are quite good; in fact, Irons, the son of Jeremy Irons, has never been better. Yet there's no way that up-and-coming actors can pack the oomph of movie stars who carry themselves like they know they're at the shimmering peak of their fame. Then again, it's fun to see how the passing decades have changed things. The rogue agents menacing Joe are no longer bent on grabbing Middle Eastern oil fields — a plot reflecting the '70s energy crisis — but obsessed with Islamic terrorism. The high-tech equipment used to trace Joe in 2018 is vastly more Big Brother-ish than it was in 1975, whose state-of-the-art spyware now seems comically primitive compared to a cell phone. And in a shift of gender roles, von Sydow's Euro-cool professional killer has morphed into a sociopathic hit woman (played by actress Leem Lubany). Still, the crucial difference between the 1970s movie and the current TV show lies in their relationship to our culture. Three Days of the Condor would've fit snugly in a 1970s time capsule. It perfectly captured liberal America's paranoia about misuse of government power in the wake of Watergate, the fishily explained assassinations of Martin Luther King and the Kennedys, the FBI's targeting of the civil rights movement and revelations about the CIA's role in toppling governments. Back then, conservatives usually defended the intelligence services in the name of national security, expressing outrage that pop culture portrayed them as tools of amoral repression. These days, the paranoia cuts in a different direction. President Trump and his followers assail the intelligence agencies for being the guardians of what they call the "deep state." This, the argument goes, is a shadowy network of entrenched bureaucrats, high-level politicos and financial elites who defend their power by any means necessary. Ironically, the right now talks about intelligence service conspiracies, while the left looks to former agency heads like Robert Mueller and John Brennan to tell the truth about what's going on. You find none of this political topsy-turvy in Condor — at least not in episodes available for preview. Indeed, it seems to be caught in an earlier era — unlike, say, the last two seasons of Homeland, which, for all their nuttiness, speak to our historical moment. Condor is an entertaining show, but it's just a show. No one will ever put it in a time capsule. This is FRESH AIR. The new television series "Condor," which begins on the AT&T Audience Network June 6, is a spy thriller starring Max Irons, William Hurt and Mira Sorvino. It's based on the 1975 film "Three Days Of The Condor," and the novel that inspired it, James Grady's "Six Days Of The Condor." Our critic at large John Powers has seen the opening episodes. He says in addition to being entertaining, it got him thinking about how our ideas of intelligence agencies have shifted over the years. JOHN POWERS, BYLINE: Near the end of Philip Roth's novel, "Operation Shylock," the Roth figure meets a Mossad agent who makes light of the modern penchant for conspiracy theories. It's a paranoid universe, the spy tells him, but don't overdo it. Hollywood never over-did it more than in the 1970s. In the years after Richard Nixon's tarnished presidency, movie screens were flooded with conspiracy thrillers, from "Chinatown" and "The Parallax View" to "All The President's Men." One of the most enduringly popular was "Three Days Of The Condor." This 1975 hit starred Robert Redford as a CIA analyst who becomes the target of his own agency. And to escape an assassin, played by Max von Sydow, he winds up forcibly enlisting a complete stranger, played by Faye Dunaway. This hall of mirrors story has been updated in "Condor," a gripping new series on AT&T's Audience Network. Transposed to D.C. from New York, the show stars British actor Max Irons as analyst Joe Turner who writes terrorist-hunting algorithms for the CIA under the eyes of his uncle, Bob. That's William Hurt, an agency bigwig whose in-house nemesis is played by Mira Sorvino. Joe stumbles across information so volatile, it gets all his office mates killed and forces him to run for his life. As before, he Shanghais a woman - here a lawyer played by Katherine Cunningham - but less creepily. She's at least someone he's been on a date with. He must try to survive long enough to figure out who to trust, who wants him dead and why. Alas, Joe is no Jason Bourne - only a brainy guy with deep moral qualms about his work. Early on, his CIA pal Sam takes him into the agency's war room and tells him that his algorithm has flagged a possible terrorist, Ammar Nazari, who's carrying a menacing suitcase and is headed somewhere. Here, Joe slowly grasps what's going to happen. MAX IRONS: (As Joe Turner) Sam, is that Conquest Field? KRISTOFFER POLAHA: (As Sam Barber) It's where Nazari has been working as a janitor for the past six weeks until your program flagged him. POLAHA: (As Sam Barber) Joe, your uncle has been running with this all by himself. IRONS: (As Joe Turner) Bob is running this? POLAHA: (As Sam Barber) We had no idea. So if you have an issue with it, you take it up with him. But you do it on your own time. Nazari right now is on his way to a stadium filled with people, as we speak. IRONS: (As Joe Turner) So you have a state trooper pull him over. You search the car. POLAHA: (As Sam Barber) What if he detonates it? IRONS: (As Joe Turner) That means what? POLAHA: (As Sam Barber) Exactly. What is it? Is it nuclear, biological, chemical? We don't know what. Why are we going to give this guy a chance to pull the trigger? IRONS: (As Joe Turner) OK. Wait. You're going to kill him, aren't you? That's what this is. That's what this room is, right? POLAHA: (As Sam Barber) It's why you're here. POWERS: Now, "Condor" differs from the original movie in several ways - most obviously that Irons and Cunningham can't match the charisma of the alluringly aloof Redford and the spiky Dunaway. It's not their fault. Both are quite good. In fact, Irons, the son of Jeremy Irons, has never been better. Yet there's no way that up-and-coming actors can pack the oomph of movie stars who carry themselves like they know they're at the shimmering peak of their fame. Then again, it's fun to see how the passing decades have changed things. The rogue agents menacing Joe are no longer bent on grabbing Middle Eastern oil fields, a plot reflecting the '70s energy crisis, but are obsessed with Islamic terrorism. The high-tech equipment used to trace Joe in 2018 is vastly more Big Brother-ish than it was in 1975, who's state-of-the-art spyware now seems comically primitive compared to a cellphone. And talk about shifting gender roles. Von Sydow's Euro-cool professional killer has morphed into a sociopathic hit woman played by the actress Leem Lubany. Still, the crucial difference between the movie and "Condor" lies in their relationship to our culture. "Three Days Of The Condor" would have fit snugly in a 1970s time capsule. It perfectly captured liberal America's paranoia about the misuse of government power in the wake of Watergate, the officially explained assassinations of Dr. King and the Kennedys, the FBI's targeting of the civil rights movement and revelations about the CIA's role in toppling governments. Back then, conservatives usually defended the intelligence services in the name of national security - expressing outrage that pop culture portrayed them as tools of immoral repression. These days, the paranoia cuts in a different direction. President Trump and his followers assail the intelligence agencies for being the guardians of what they call the deep state. This, the argument goes, is a shadowy network of entrenched bureaucrats, high-level politicos and financial elites who actually run things, no matter who gets elected president, and who defend their power by any means necessary. Ironically, the right now talks about intelligence service conspiracies while the left looks to a former agency heads, like Robert Mueller and John Brennan, to tell the truth about what's going on. You find none of this political topsy-turvy in "Condor" - at least not in the episodes available for preview. Indeed, it seems to be caught in an earlier era - unlike, say, the last two seasons of "Homeland," which, for all their nuttiness, speak to our historical moment. "Condor" is an entertaining show. But it's just a show. No one will ever put it in a time capsule. DAVIES: John Powers writes about TV and film for Vogue and Vogue.com. Transcript provided by NPR, Copyright NPR.